In the absence of, you know, an actual magazine to shoot for, I've been revisiting some of my favorite recipes on the blog and re-imagining them in layout form (though I, by no means, claim to be any sort of graphic designer). Here's one of my recent favorite recipes, especially since I've been sort of obsessed with forms of frozen ice this summer--despite the relatively mild weather we've been having in the Bay Area. 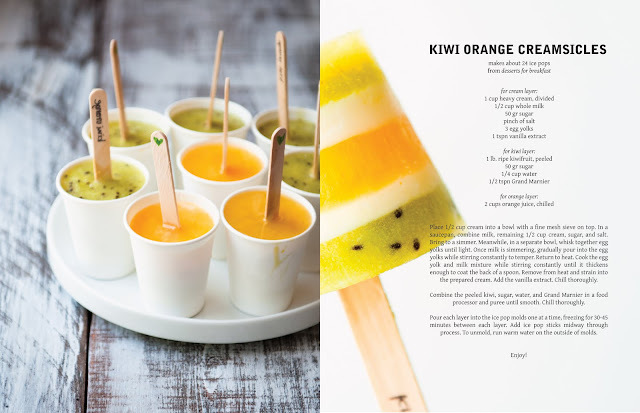 Stay tuned and clear your freezers for more ice pops soon on the blog! Can't believe it's Friday, but here's wishing you all a happy weekend! This just looks too darn yummy!!! Nom Gourmet ice pops!! I have some Guava juice, I wonder if I can add that as well? Labor of love indeed! looks great.....like the pic on the left even more than the one of the right (on which the recipe appears).....happy weekend to you too! I love the layout idea! Great recipe for this hot weather. These looks so tasty and delicious! Yum! Beautifully photographed too. These are gorgeous and I think the layout is beautiful! How refreshing and yummy they look! Guess I need to brush off my old tuperware popsicle maker thingeys that I've had since my kids were little!! These are beautiful. Love your blog! What type of lens do you typically use? Your pictures are stunning. These photos are beautiful! And you fooled me with the layout. It looks great. This recipe looks scrumptious too. With summer really ramping up I am going to have to give these a try. LOVE the layout idea. Bravo, looks awesome!